Freedom of the press belongs to the one who owns it. Arthur J Liebling. alAmeen, humbly started as a community based newspaper in August of 2002, with limited budget and resources, driven by dedication and motivation only to please Allah Almighty. Although the founding members, management and the editorial board members varied from time to time but each and everyone had a sincere desire to serve the muslim community. Their valuable time and dedication & support helped us achieve newer heights & levels which to this day remains intact. Today as we embark on a new medium of serving the community through the internet all credits are due to the current editorial board who have stayed the course of the high and lows of Alameen in order to cement their vision to establish a Muslim friendly media. During this difficult course, alAmeen have indeed achieved remarkable milestones, gaining new and unexpected readership, by gaining popularity among the Non-Muslims, who wished to be enlightened by the Islamic perspective – on current affairs and towards the understanding of the faith, and we could be certain that it is making an impact. Therefore, we humbly request our readers to bear in mind that by the grace of Allah, alAmeen is now more than just a community based newspaper. Therefore, it is imperative for alAmeen board to provide fair, and balanced perspective on news which is inclusive of news and issues concerning and affecting Muslims and Non-Muslims alike – nationally and globally. The editorial board of alAmeen would like to wish everyone: the readers, writers, contributors, supporters, advertisers, volunteers and especially our critics, in assisting us with positive and constructive criticism for the past seven years,–a happy, and blessful Eid mubarak. YOU have made us, who we are – Thank you! Jazak -ul- Allah Khair! The editorial board members are devoting their time and efforts in the local community's affairs. The paper adheres to Sunni Muslim Guidelines. The collective vision of alAmeen’s Management and Editorial Board, since inception, has, and will remain – to fill the void. 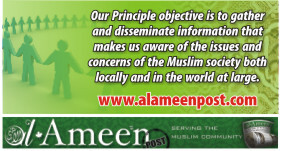 However, the Board remains unanimous on its vision, and its guiding principles that alAmeen, purely based on its duty, in accordance with the journalistic standard, is essentially a news reporting agency – alAmeen is not a religious authority on Islam – and its content should not be deemed as such. Although, alAmeen vigilantly strives to maintain its news contents purely in accordance with the Islamic teachings and have raised the bar high above all other news reporting agencies, in regards to the content, the quality, as well as the goods and services it promotes – which must also be in “strict” compliance – falling within the realm of Muslim lifestyles. However, maintaining the balance: first identifying the boundaries between, the news, in light of Islamic morals and values, then clarifying the distinction between the two, and finally assessing the news worthiness of the matter is not as simple as one might perceive it to be. There remains a fine line in the sand – Grey Areas – given the fact that Islam is an all inclusive faith, and not a regional tribal domain, accommodating numerous views, considering various scholarly opinions, acceptance on various school of thoughts – most of them highly regarded by the majority. Thus, catering to the needs of a community which extends from far-east to the far-west, and accommodating everyone’s point of view is indeed – an Odyssey. As someone once said, “Islam in China is Chinese, and Islam in Europe is European.” That is the fact, what may be news worthy to a Chinese Muslim may very well be irrelivent to a European Muslim, and vice-versa. Therefore, alAmeen board would like to take a moment to share with the audience regarding the difficulties it faces in light of its duty as a newspaper serving a broad spectrum – a constellation of views, opinions, ideologies, cultures, school of thoughts, etc – among its readership, who are united in faith, differentiating in views and opinions, culturally and linguistically. The duty of a news agency is to deliver fair and balanced news in a timely manner to its audience. It neither endorses nor does it enforce its readers to accept its contents at face value. An increase among the readership of alAmeen by Non-Muslim Canadians is one such example of that. These readers have dared to compare whatever the western media may be spinning against Islam and Muslims, in light of what alAmeen is delivering to its audience. alAmeen strives to disseminate information which impacts the Muslim Ummah (Nation), reflecting their views, nationally and globally, and hope to engage its audience into a debate on any given issue, on an individual or collective basis. alAmeen’s goal is not to impose its own views, ultimately –fixating its audience – in a mental prison of imposed thought pattern of the board. Rather engaging its audience in a debate, challenging the status quo, being enlightened and informed citizens of the community. Therefore, to achieve that, alAmeen has a legal, moral, and ethical obligation to deliver the news, which normally, has already been reported by the media in the Muslim world. Whether the person(s) agrees or disagrees, is entirely upon that individual. In case a disagreement arises or if the reader is unsure about a topic being reported, especially topics related to the application of the faith (Fatwa or Religious Verdict), the readers have an option to engage in debate, or have the religious authority clarify that matter. However, alAmeen is proud to state that it does try its level best to investigate the source before publishing, in regards to a religious verdict. However, please bear in mind, a religious verdict, published in alAmeen is not an automatic endorsement of such a verdict. Nonetheless, alAmeen also recognizes that it would be impossible to have a unanimous agreement on all issues – should that be a barrier for alAmeen or any media – to divert from its legal, moral and ethical obligation towards all of its readers? Which views and opinions are acceptable and which ones are not, could only be decided – individually – by the audience, not alAmeen? The Board cannot impose upon its audience as to which news item is “Islamic” or which one is not? Rather the criteria used is on the basis whether or not the news impacts or affects all Muslims? It would be impossible to precisely state the percentage of muslims affected. On that note alAmeen Board would once again like to express its humblest gratitude for the past support, and looks forward to the same as we embark upon a new journey, to greater heights. All comments posted on Alameenpost.com will be moderated by our online editor. Please follow basic rules - Respect for others, No Personal Attacks, do not Condemn or degrade others beliefs, nor harass, abuse or threaten others and refrain from posting obscene and fowl comments that can be regarded objectionable. Alameenpost.com reserves the right to delete/edit any comments posted without any reason. The views expressed in the comments section does not in any way suggest an agreement or disagreement or as an endorsement of alameenpost.com. Alameenpost.com does not assume any responsibility or liability of the comments posted. Minors and children under 14 are advised to seek Parent/Guardian approval before Posting comments. As posting in this section is a free service, there are no warranty or guarantees given or implied. Use of this section is at your own risk. Your use of this section constitutes an agreement that you will not hold alameenpost.com or its affiliates liable for anything said or done in the service to anyone at anytime. Use of this section signifies that you are in total agreement to the terms contained here within. If you disagree with any of these terms, then please do not use this section. Alameenpost.com and its affiliates reserve the right to ban anyone from using this section at any time and for any reason they deem necessary to include, but not limited to: Abusive language or comments; Disrespect of others; Causing a disturbance; Purposely annoying others. Alameenpost.com does not discriminate due to race, color, or religious background. Al-Ameen may contain copyrighted material the use of which may not always have been specifically authorized by the copyright owner. Whenever possible, we credit the copyright owner, but at times material is sent to us over the internet without the appropriate credits. In these cases, it is impossible for us to establish the identity of the original copyright owner. However, We are making such material available to our readers under the provisions of "fair use" in an effort to advance a better understanding of political, economic and social issues. Al-Ameen newspaper is always distributed at no cost to the readers. Anyone desiring to use copyrighted material from this site for purposes that go beyond 'fair use' must first obtain permission from the copyright owner. We assume no responsibility for the views expressed on this website, including all articles, commentary, features, letters to the editor, or advertising. Views expressed on this website do not necessarily reflect the views of the publisher, the managing editors or the editorial board. We apologize in advance for any errors contained within this site.